This Magazine has been a huge hit. 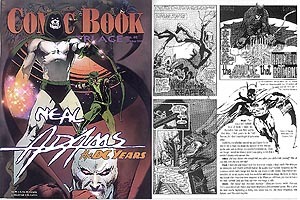 To start with, the cover was a drawing Neal Adams did that Bill Sienkiewicz decided to color by computer. Inside is an interview with neal by Arlen Schumer. Arlen, as you may know, is Neal's favorite interviewer. So much so that he asked Arlen to do the interview and layout for the Neal Adams Sketchbook. 47 PAGES FILLED will Neal Adams art. Some color. This should be considered a book as it is better than the Art of Neal Adams and the Treasury books.